Back home, optimism was in the air for the third quarter earnings season. Upgrades in the gross domestic product growth estimates for the fiscal year also boosted investor sentiment. The government’s reassurance that its economic policies would be growth-oriented also propelled the markets. Moving ahead, the holiday mood is still in the air. 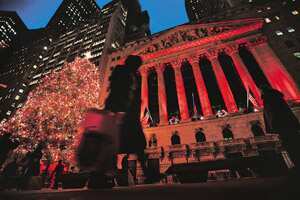 Markets in the US and all major European bourses would be closed on Friday and the UK, Indian, Australian and New Zealand markets would be shut on Monday, so no major fund activity is expected. However, gains are likely to be extended this week on optimism about a sustained global economic recovery. In the US, however, the Treasury’s $118-billion auction of two-year, five-year and seven-year notes will be watched by investors for clues to demand for US debt as efforts to fuel growth pump up government spending in the world’s biggest economy. Besides this, the Conference Board’s index of December consumer confidence will merit the Wall Street’s attention on Tuesday. The October S&P/Case-Shiller home price index will be watched closely on Tuesday, apart from the weekly government report on jobless claims on Thursday. French third quarter gross domestic product (GDP) data on Tuesday would also be watched for a sense of economic activity in Europe. Technically, the markets are all set to touch new 52-week highs this week as the trend is clearly pointing up. Some key technical indicators are even suggesting sharp gains this week. In terms of the S&P CNX Nifty, the first meaningful resistance is at 5,252 points, and if this is crossed then the next resistance would come at 5,297 points. This level would offer a rising Nifty some trouble, but would not be strong enough to arrest the momentum. If this level is crossed, the next resistance would come at 5,411 points, which could threaten to retard the momentum. I am expecting profit selling to emerge at this level. On its way down, the Nifty will have its first, moderate support at 5,128 points. It would be followed by 4,991 points, which is a strong support and should offer solid ground for the Nifty to bounce. In terms of the Bombay Stock Exchange (BSE) Sensex, the base is set for 18,000 points this week. However, the Sensex would see its first resistance at 17,513 points, followed by 17,745 points. I am expecting a very strong resistance emerging at 18,074 points, which would arrest the positive momentum. On the downside, support for the Sensex is placed at 17,191, 16,912 and 16,733 points. Among individual stocks, Hindustan Zinc Ltd, CESC Ltd and Alstom Projects India Ltd look good on the charts. Hindustan Zinc, at its last close of Rs1,208.90, has a target of Rs1,238 and stop-loss of Rs. 1,176. CESC, at its last close of Rs391.20, has a target of Rs404 and stop-loss of Rs377, while Alstom Projects India, at its last close of Rs564, has a target of Rs582 and stop-loss of Rs548. From my previous week’s recommendations, JSW Steel Ltd, Sesa Goa Ltd and Hindustan Zinc Ltd all overshot their targets by a wide margin.